There is an intruder in the waters where you live, and it is up to you to stop it. Control different fish as you eat your way up the food chain and get to the mysterious intruder. All is not well, and there are multiple obstacles that stand in your way. Can you succeed in saving your waters? The gameplay found in Feeding Frenzy 2 is extremely straight forward. Swim around the area eating small fish to get bigger, and then bigger fish to become even bigger. Once you fill up your meter you beat the level and continue to the next. With endless lives through continuations, there isn’t really any penalty for dying. The only penalty would be starting over the level if you used up all 15 lives through 2 continues. Friends and Family that have absolutely no experience with games and sit down and laugh as you play the game. The game has multiple different fish types to eat, as well as powerups and obstacles. Each powerup helps towards beating the level, while the obstacles hinder you. Powerups include speed boosts, fish shields, and more to be discovered. Obstacles include squids that blind you, poisoned fish that reverse your controls, and mines that instantly kill you. Certain levels will also throw other hindrances in your path such as pitch black surroundings that you need to light up to see the fish. Younger players will get much more joy out of the game, as older players will get bored after a while. The game is simply too easy. No real challenge is present, and a normal gamer can beat the entire thing in a day. There isn’t really anything special about the Audio. Voice actors may have helped develop the characters and the soundtrack wasn’t memorable. The graphics were nice but they are also not really special. There are only a few backdrops and about 15 fish variations. 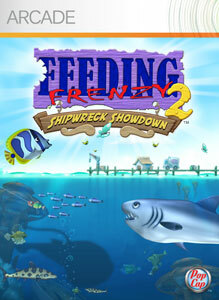 The Achievements in Feeding Frenzy 2 are extremely easy. They just take time. One play through should get you a majority of the achievements. The miscellaneous achievements and party achievements can all be achieved with a dud controller as second player. The most annoying achievement is to complete Time Attack. Plenty of time is given to complete it, but after completing the game once, replaying it just feels too similar and you have to regainall your powerups. Fast Food – 20 – Complete Time Attack! Simple gameplay makes the game fun for the whole family, and added co-op features makes Feeding Frenzy 2 fun to play together. Multiple power ups and 60 levels create a fun relaxing game that anyone can enjoy. The game can get bland and repetitive if played by yourself and in long sittings, but it is still fun. A great purchase for kids and a fun experience for everyone else, but the overly simple game is unable to hold onto the enjoyment for extended periods of time. Fun for the whole family with co-op and party modes. Easy to pick up and enjoy. 60 levels with gameplay twists and new powerups as you progress. You can easily lose track of your own fish.